Just when he's finally on board, they meet the previous owners, an elderly couple who spent their whole lives there. Diane is devastated by the thought they're somehow stealing their home, sending her spiraling into depression. Eventually, they compromise by agreeing to hold one final Christmas in the house for the couple and their extended family. See, we were getting there. This involves Sam dressing up in a Santa suit in 80-degree heat while everyone celebrates. Even this isn't enough - when one of the children proclaims they can't remember Easter in the house, Diane reacts by inviting them over for an Easter celebration the following week. Sam intervenes and rather impolitely throws the family out, proclaiming the house is his and Diane's now. He's prepared for an argument with Diane, but she surprises him by saying his ejection of the previous tenants made the house feel like it was finally theirs. While there were highs and lows here, the jokes hit more often than not. A lot of credit goes to Ted Danson and Shelley Long, who sell their bizarre characters extraordinarily well. Overall, I felt this one worked. This fun yet disjointed episode from the sixth season is set on Christmas Eve. There's a lot going on, but very little connective tissue aside from the holiday. The closest thing we get to an A-plot concerns Sam trying to find a gift for Rebecca on Christmas Eve. He didn't buy anything beforehand because he was upset she's making them work on the 24th (more on this in a moment) and because he hadn't thought anyone else would pick up anything, either. He wanders around, trying to find an open store, then stumbles across a stewardess who offers to sell him one of the presents she'd purchased. This seems like a blessing, but things go horribly wrong when he takes the wrong gift - diamond earrings instead of earmuffs - and winds up spending $500. 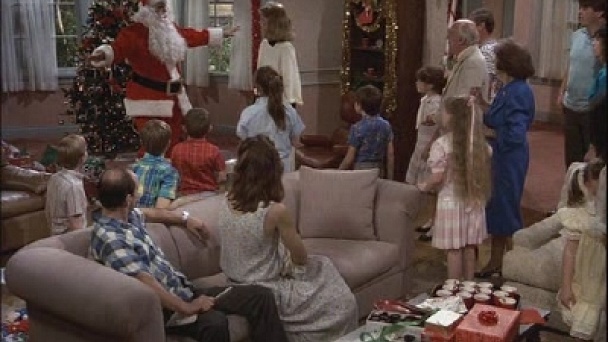 I mentioned they were being forced to work on Christmas Eve, which is another of the episode's myriad stories. I'm not clear why they'd expect to get the day off - this is a bar, after all. The only one initially bothered by this is Sam, who winds up spending most of the time outside looking for a gift, anyway. Everyone else starts out being fine with the idea, though there's a moment where they try to get out early by pressuring the last patron to leave. Oddly, this occurs fairly early on in the episode, and it falls apart when a crowd joins him. There's quite a bit more - it feels like everyone has a minor story going on. 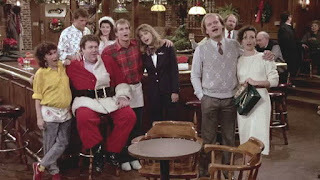 Cliff tries (and fails) to win a trip by amassing cans in a food drive, Norm has a job playing Santa, Frazier is dealing with depression around the holidays... and so on and so forth. None of it adds up to much or changes the status quo, but that seems to be the point. This isn't an episode about learned lessons, character growth, or profound themes - it's thirty minutes watching characters trip over themselves in a bar. It's not fantastic, but it's funny and light enough to be enjoyable. 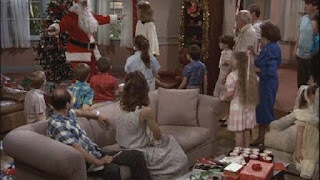 This episode from the last season involves a B-plot that's connected to the holidays and an A-plot that was probably written before they had any idea when the episode was going to air. The title refers to Sam's underhanded approach to getting his car back. Apparently, he sold it earlier in the season in order to rebuild the bar after a fire. The buyer passes away just before the episode, and Sam tries to swindle his widow out of the car by pretending to be her friend. If that sounds despicable, rest assured the writers were aware. Most of the fun of this centers around her taking revenge after Sam is plagued by guilt and comes begging for forgiveness. The other story centers around a live pig Woody purchased for Christmas dinner back home. Rebecca falls in love with the animal and begs him to sell her the pig rather than slaughter it. When he refuses, she steals it and releases it into the wild. Eventually, the animal makes its way back to Woody's family's home... where it's killed and eaten. I enjoyed this one more than I expected to. The episode started slow - the premise initially delivered more awkwardness than laughs - but the turnaround made up for that. Once again, this wasn't phenomenal television, but it was solidly entertaining. The holiday elements, however, felt relatively trivial. As far as I can tell, these are all the holiday installments Cheers produced. Given how many seasons it was on the air, I'm a little surprised there weren't more - you'd think a bar would be an interesting place to tell a Christmas story. 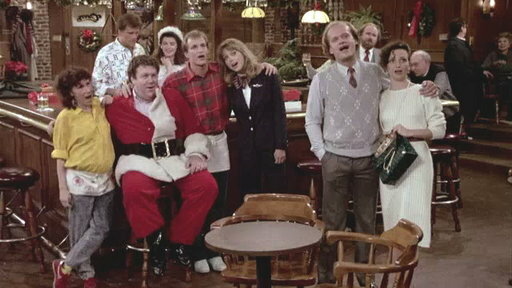 Likewise, it's surprising only one of these three - Christmas Cheers - fits the mold of a typical holiday episode (though the season one episode is fairly festive as well). After our disappointment with the first Christmas episode, it's nice to see some of our positive associations with the show actually do hold up. Turns out, there's a reason this series is as fondly remembered as it is.